DEL MAR, Calif. & JACKSONVILLE, Fla. - Dec. 11, 2018 - PRLog -- HDOnTap partners with the American Eagle Foundation (AEF) to live stream the Northeastern Florida Bald Eagle Nest Cameras and give viewers worldwide an unprecedented insight into the entire bald eagle nesting process in the wild. The NEFL bald eagle nest is located in Northeastern Florida, about 80 feet up in a Longlaef Pine tree, and was built by the resident eagles, Romeo and Juliet, approximately eleven years ago. According to AEF, through the years, the nest has grown considerably in size and weight (likely weighing close to a ton). The NEFL nest offers three camera views streaming 24-7, live HD video and audio, as well as daily time-lapse clips on screens worldwide. Two live cameras are located on the nest tree and provide different intimate views of the nest. The third camera is mounted on a nearby tree at a lower angle and shows the nest tree and the canopy. Tune in and watch live as Romeo and Juliet are currently in the incubation period (with two eggs) of their nesting cycle. Juliet laid her first egg on November 14, 2018 and the second on November 17, 2018. The incubation period is approximately 35 days from the time each egg was laid, so expect to see the first hatch around December 19, 2018. "We are thrilled to be able to provide our live streaming services to the American Eagle Foundation, which will allow AEF to put more money into their mission of protecting Bald Eagles and other birds of prey," says Tiffany Sears, HDOnTap Co-Founder. For over 7 years, HDOnTap has provided live streaming solutions to resorts, amusement parks, wildlife refuges and more. In addition to maintaining a network of over 500 live webcams, HDOnTap specializes in the design and installation of remote, off-grid and otherwise challenging live streaming solutions. 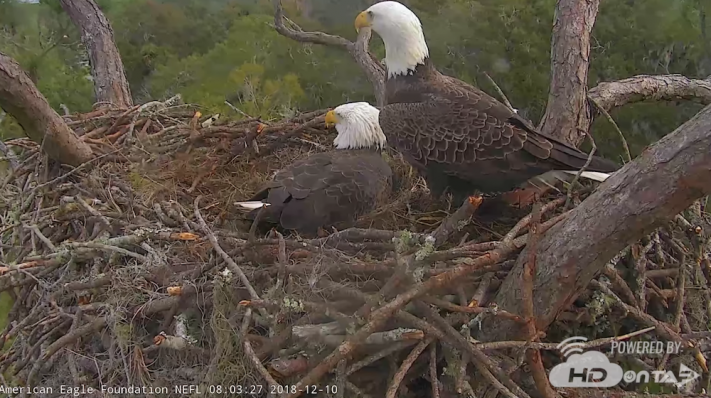 The NEFL Bald Eagle Nest live cameras are available to watch on HDOnTap's website at: https://hdontap.com/index.php/video/stream/nefl-bald-eagles and on the American Eagle Foundation's website at: https://www.nefleaglecam.org/. The Hanover Bald Eagle Nest Cams Are Now Live! The Hanover, PA Bald Eagle Nest Cams Are Going Live!